Earlier today, we mentioned in passing, that Joe Crowley is one of the most corrupt Members of Congress... in history, and that he's been facilitating corrupt relationships between freshmen New Dems-- he's the ex-Chairman of the Big Business-owned coalition of anti-working family Democrats. Then I realized it's been months since we've covered Crowley. Since the Juniper Park Civic Association first published the piece below in March 2012, Queens Democratic boss, Crowley, has been given a formal position inside the House Democratic leadership, bringing disgrace on every Democrat in Congress. Everyone in Congress knows what a corruptionist Crowley is and how he took money (bribes) from Wall Street during the Ways and Means Committee hearings on Dodd-Frank and then voted to water down the legislation in favor of the banksters who lined his pockets. It isn't a secret and the House Ethics Committee publically called him out on it-- before rolling him into a deal that let him and a couple of equally crooked Republican corruptionists off the hook. But he shared that money out with enough Democrats-- just the way the Republicans do it-- to win himself the vice chairmanship of the House Democratic Caucus. They have no shame. The folks in Queens and the Bronx this crook is supposed to be representing-- from his tony digs in Virginia, where he lives-- know a lot more about Crowley and are trying to spread the word among Democratic voters whose understanding of politics doesn't go much beyond, "Republicans= bad; Democrats= good or, more likely, not as bad." 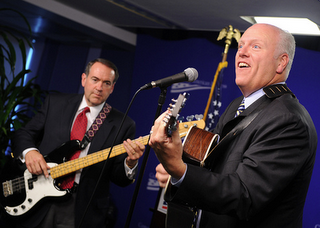 Joe Crowley is as bad... just as bad. ...Borough President Manes was accused of using political appointments and favors as the source of large kickback schemes involving personal bureaucratic fiefdoms such as the New York City Parking Violations Bureau. Zoning and Cable TV franchises were also being investigated, and some of Manes's appointees and associates were indicted or forced to resign. On March 13, 1986, the disgraced Manes plunged an eight-inch blade into his heart, committing suicide. Donald Manes was followed in office by Deputy Borough President Claire Shulman, who served until 2002. ...Meanwhile, Walter H. Crowley's nephew, Joseph was about to graduate Queens College with a B.A. degree in political science. Joe, who was known for his partying and playing in a rock band, was immediately tapped by Queens Democratic boss, Thomas Manton, to fill the empty seat in the 30th Assembly District which covered Maspeth, Elmhurst and parts of Middle Village. He was all of twenty-four years old with absolutely no experience in holding a political office or any other job. Joe Crowley served 12 years in the New York State Assembly running every two years unopposed. In 1998 Congressman Tom Manton announced his retirement from Congress shortly after the deadline passed for individuals wishing to file for the Democratic primary. (Manton was the only individual who filed for the primary.) As head of the Queens Democratic Party machine, Manton was able to handpick his successor-- Joe Crowley. Unopposed, once again, the Crowley family was given an elected office on a silver platter. Tammany Hall style politics again rears its ugly head. Since being elected to Congress, Crowley has yet to face a serious challenge for his seat, as he usually runs unopposed. 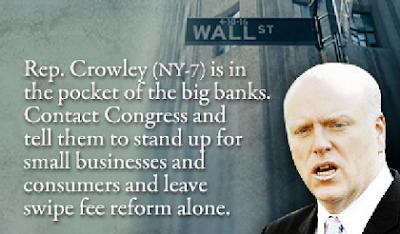 While in Congress, Crowley has turned his back on our community and New York City. While pretending to live in his mother's house in Woodside, he secretly moved his family to Arlington, Virginia in 2004. The New York Post reported that he enrolled his children in the renowned public schools of this affluent suburb of Washington, D.C. shunning New York City's educational system. Talk about arrogance. In Congress, Joe Crowley often takes positions opposite to those of the middle class... Clearly, Congressman Crowley also does what special interests want. Let's examine his latest abomination: H.R. 658-- FAA Air Transportation Modernization and Safety Improvement Act: The bill authorizes appropriations for the Federal Aviation Administration for fiscal years 2011 through 2014, to streamline programs, reduce waste, improve aviation safety and capacity, and provide stable funding for the national aviation system, among other things. Our neighborhood is near two large airports and we certainly could benefit from this bill. Supporters of this bill gave Joe Crowley $16,650. However, opponents of the bill such as teachers' unions, building trades unions and railroad unions gave Crowley a whopping $85,950. So how did Crowley vote? He voted NO. Luckily the bill passed both the House and the Senate and is awaiting approval from the President. Joe Crowley did not have the qualifications to be elected when he was 24 and fresh out of college. He has made his living off of backroom politics and treating the electorate as chumps. His 25-year political career has been plagued by one unethical trick after another. Worse than that, he has taken big money from special interest groups and has consistently voted against the interests of his constituents, New York City and the United States. And now he's bringing along naive freshmen like Sean Patrick Maloney, Ann Kuster and Kyrsten Sinema down the Wall Street road. Last week he helped organize a "getting to know bribe you" tour of Wall Street for mostly New Dem Wall Street shills who have been voting consistently in their committees with the Republicans to gut the already feeble protections afforded consumers-- and society-- by Dodd-Frank.